The Yeti is one of the most advanced and versatile multi-pattern USB microphones anywhere. Combining three capsules and four different pattern settings, the Yeti is an ultimate tool for creating amazing recordings, directly to your computer. 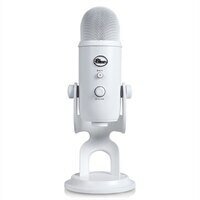 With exceptional sound and performance, the Yeti can capture anything with clarity and ease unheard of in a USB microphone. The Yeti features Blue's innovative triple capsule array, allowing for recording in stereo or your choice of three unique patterns, including cardioids, omnidirectional, and bidirectional, giving you recording capabilities usually requiring multiple microphones.